How do I keep my bicycle chain clean? The easiest and possibly the most effective way to keep your bicycle riding smoothly is to lubricate your chain. It is easy, costs very little, and has a tremendous effect on the ride quality of your bicycle. The best way to keep those links looking good is by getting the right chain lubricant and using it sparingly. We can help. We carry quality chain lubes designed to prevent drivetrain wear and increase efficiency without getting grimy over the long haul. Once you get some, apply a drop to every other link any time you notice that the chain is beginning to look dry. The sign that you’ve waited too long is squeaking. That’s bad. It means the links have become dry and that if you keep riding, you’ll accelerate chain and sprocket wear (it’s also a lot harder to pedal). So lube the chain immediately. When you apply lube, let it sit a bit and then wipe off the excess. You don’t want too much oil on your chain because it’ll pick up dirt (which makes things wear faster) and increase the amount of grime that builds up in your sprockets and derailleurs. A messy chain is a hassle, too. It marks you with hard-to-remove grease tattoos anytime you get near it, and it’ll do the same to your car if you transport your bike in it. If you make the mistake of using too much lube or a heavy oil not made for bicycle chains, you’ll probably turn the drivetrain into a black mess. Depending on how filthy it is, you might be able to clean the links by thoroughly wiping the chain with a rag. It’s a good idea to put some disposable gloves on first to keep the gunk and chemicals off your skin. Then, spend some time wiping at the links until the chain is as clean as you can get it. Also, wipe the chainrings and derailleurs to degrease them. Doing this once will convince you that it’s worth it to use the right lube and not too much of it. 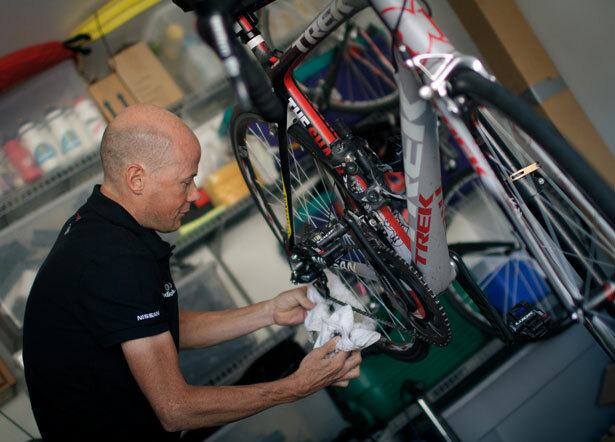 If you have any questions about the care of your drivetrain and how you’re doing, bring your bike by and we’ll have a look and make some suggestions. We’re also experts at chain maintenance if you decide your filthy links need a good bath.